Moore brought along one of the interviewees from his film: 99-year-old Ben Ferencz, the last surviving prosecutor from the Nuremberg Trials, who told the New Yorkers present in a booming voice, “You’ve got to be alert to the danger” of fascism in the United States. From that post-game show, you can tell that “Fahrenheit 11/9” is not subtle, and it is not sympathetic to the view that what we need now is civility and centrism. 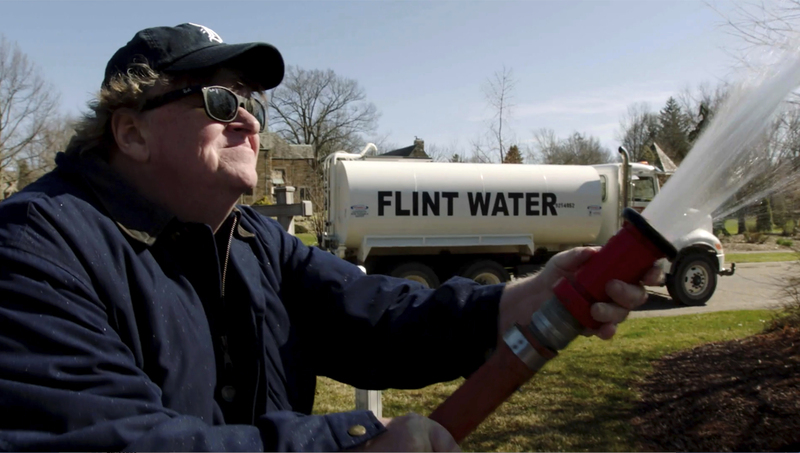 “Fahrenheit 11/9” did poorly at the box office on its opening weekend, especially compared with Moore’s record-setting 2004 documentary “Fahrenheit 9/11,” possibly because one can now stay at home and consume two hours of this stuff by simply scrolling through Facebook or Twitter. It may also be relevant that Moore supported Bernie Sanders over Hillary Clinton in the 2016 Democratic primaries, and Clinton diehards are in no mood for a film that excoriates the Democratic Party—and the Clintons in particular—for abandoning the working class in favor of Wall Street donations. Mitch McConnell and Paul Ryan are barely seen in “Fahrenheit 11/9,” but Moore, as narrator, dismisses “old guard” Democratic leaders including Nancy Pelosi and Chuck Schumer as roadblocks to an effective resistance to Trump. “Fahrenheit 11/9” does avoid the question of just how much racism and sexism had to do with the outcome of the 2016 election. Trump himself is not in “Fahrenheit 11/9” as much as the movie posters suggest. The film opens with the shock of Election Night 2016 (Moore cannot help but note that he was quoted on Fox News as having said of Trump, “Dismiss him at your peril”) and ends with footage of Adolf Hitler dubbed with Trump’s voice. But most of the time is spent on hotspots of liberal activism. Pointedly, the three major locales are in states carried by Trump: Flint, Mich., a majority-black city taken over by state administrators whose rash decisions in 2014 ended up poisoning the water supply; almost-all-white West Virginia, where public school teachers went on strike early this year over low pay; and Parkland, Fla., the site of the mass shooting at a high school in February. Aside from a few glimpses of the Bronx’s Alexandria Ocasio-Cortez among Democrats running for office this fall, the blue states of the Northeast Corridor and the West Coast do not figure into Moore’s portrait of left-wing activism. He leaves no doubt that he holds both New York and Hollywood responsible for Trump’s rise. Speaking of the election, blue-state viewers may feel that there is something missing in “Fahrenheit 11/9.” Aside from footage with some of the most unhinged attendees of Trump campaign rallies, the voters who actually put him in office are nowhere to be seen. Moore might argue, with justification, that the same media outlets who gave Trump so much free publicity in 2016 have since given us more than enough interviews with diehard Trump supporters. But “Fahrenheit 11/9” does avoid the question of just how much racism and sexism had to do with the outcome of the 2016 election, which makes it harder to judge how representative his labor heroes in West Virginia are of the entire state. Perhaps Moore feels that he can instill only so much anger with “Fahrenheit 11/9,” and he does not want to waste it on Trump voters who may be loud but are still pretty powerless. The irony is that the reason we have Trump is people like Michael Moore and his hate. Trump is anything but fascist. Fascism is a phenomenon of the left and that is where Moore is at home. That is where America, the magazine, is at home. As racism becomes less of an issue in the United States the more it Is brought up. Michael Moore is an example of this hate. Moore pulls away the curtain so we can see the Man behind the media curtain. Whether Democrats or Republicans have been in power, things have been getting worse for everyone but the corporations and the rich. There is no left or right, actually. There are those that have lots of money and power and those who don't count. THAT is fascism. It is the disenfranchisement of the common man that caused Trump. Not Moore. Moore predicted Trump. You don't seem to have any idea what fascism is or what is taking place in the United States. The hate of the left is what gave us Trump and Moore is a prime example of that hate. I suggest you read more or at least different sources so you can compare. Try government statistics as a start. If you want to understand fascism, read Jonah Goldberg. It is not a word to use when one doesn't like something. Fascism is a concept/word associated with Mussolini who was once head of the Italian socialist party and died while trying to rewrite the Communist Manifesto. So use that as a starter. The right has no hate? Where are death threats to Ford coming from? Climatologist Michael Mann received death threats against himself and his family? Then those clowns marching through Charlottesville with Tiki torches. Give me a break. As for reading, I suggest you read more as well. Start with dusting off your physics books and then try Pierrehumbert's "Principles of Planetary Climate" and catch up with 21st century atmospheric physics. Right now, you're in the land of magic and maybe on that topic. Thank you for supporting my points. The marchers in Charlottesville were all from the left. Just different denominations. Now what has climate to do with this? You have no idea what I believe on climate or else you wouldn't bring it up. But it's irrelevant so you are supporting my points. Again thank you. Cosgrove likes to rant about "socialism" as though it's a left wing ideology as manifest in the far-right fascism of Mussolini. He must be deeply confused when he gets chicken having ordered "Buffalo wings." OMG, surely this article was written in jest. I met Michael Moore at a film festival in the late eighties before Roger and Me came out and again in Ann Arbor in 1992, when he was there to support Jerry Brown's anti-NAFTA driven primary challenge to Clinton. Moore is a hometown boy made good and he's never sold out his citizen's view of power and corruption from the perspective of his own character. He came out at a time when anti-Corpratist voices were totally shut out of the conversation, not like it is today- in some grateful measure because Moore broke through the dominant corporate owned media propaganda wall- doing so precisely because he is entertaining. Sometimes Moore swings and misses, but like the great Tiger slugger Gates Brown, when he makes contact in the pinch, its usually for the fence. Michael Moore's films are rooted in the working class cultural traditions of the IWW and old New Left pranksters, by coining new images in street agitprop and documenting them as interventionist spectacle. He can be succinct and devastating dramatizing the contradictions and hypocrisy of the Executive class, the Rentiers and even the rest of us who lost track of how we've allowed the country to be ripped off by the massive wealth redistribution schemes of the top 5%. It's worth taking a new look at Roger and Me too, I think- which is really a black comedy about Michigan, brilliant in all its eccentric detail- told as a personal narrative while making the general case of how GM abandoned Michigan in search of lower taxes and lax environmental regulations, while rewarding their top executives themselves with huge bonuses. What has happened in Flint since then is the fat end of the brutal wedge that was driven into the heart of the city by GM's Executives, break-down bankers and cowardly dweeb politicians who have profited off the misery of American deindustrialization and ignored the real needs of our communities. I'll be fascinated at how Moore focuses his lens on celebrity obsessed culture in telling tRumps story. Reality star fake billionaire tRumps election seems appropriate to the rest of Moore's outstanding work and to our time. Get out to the cinema with friends!!! This article also appeared in print, under the headline "Michael Moore asks the heartland to deliver us from Trump," in the October 29, 2018 issue. Robert David Sullivan is an associate editor at America.